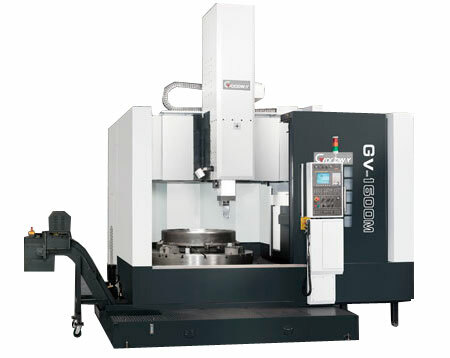 Packed with industry leading technology and top quality components, the Goodway GV-1 series vertical turning centers combine incredible power, strong constructions, and heavy duty cutting capabilities to bring you The Ultimate Machining Power®. These maximum performance machines will easily accomplish the demanding turning applications of today and tomorrow. With maximum turning diameter up to 1,800 mm ( 70.9" ), maximum weight load up to 8,000 kg ( 17,600 lb ), and available live tooling spindle & Cf-axis capabilities, turning, milling, contour milling and drilling applications may be completed in one single machine. The high-rigidity vertical turning center construction, can easily overcome horizontal turning centers' problems when machining large-diameter, heavy-weight and non-symmetrical work pieces. Fully enclosed splashguards keep chips and coolant contained for a safe clean working enviroment. Extra wide door width up to 2,100 mm ( 82.7" ) ( GV-1200 : 1,800 mm ( 70.9" ) ) enables large size work pieces to be loaded onto the work table with a crown block providing easy loading and unloading operations. The coolant system features a roll-out coolant tank for easy maintenance. Right discharge chip conveyor can be equipped with a programmable controller to minimize coolant loss and increase chip disposal efficiency. Standard BT-50 16-tool umbrella type ATC with fully enclosed guarding can be equipped with various turning, milling, and drilling tools based on different turning applications.